We are not open to the public at our warehouse. We do not maintain a public store in Florida. We sell via the internet only. and a Florida Licensed Auctioneer (Lic#AU4267). Dwight has conducted firearms auctions, both live and online! He is a federal firearms licensee (FFL). registered in the State of Florida. owned by Dwight G. Angel. Dwight Angel is a Certified Practical Gunsmith, certified by the American Gunsmithing Institute. He was certified as a Firearms Instructor in 1988 completing the Florida Department of Law Enforcement Firearms Instructor Course. 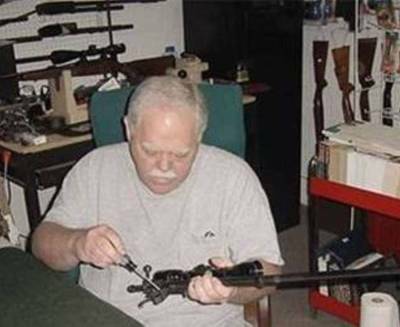 He has been working as a Gunsmith since 1984. Dwight also completed the American Auctioneers Academy and was licensed as a Florida Auction Business and Auctioneer. Click above to see all of our gun parts on auction, search there also for parts, enter part name in search box. We have over 650 parts on auction at gunbroker.com! Click on my gun parts auctions to be taken to our gun part listings on gunbroker. Who wants a broken gun? We do! We buy broken guns for parts! Tell us what you have we will buy them for parts! 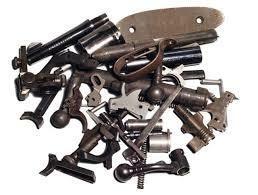 Have you got loose gun parts you don't need? We will buy them!